The Instant Pot, a cult favorite, has everything you need in a pressure cooker, plus extras. The seven functions on this 6-quart model are: pressure cooker, slow cooker, rice cooker, sauté/browning, yogurt maker, steamer, and warmer. The control panel makes cooking easy, with high and low pressure, three sauté temperatures, slow cook, and warming all at the touch of a button. You almost don’t need another appliance in your kitchen. The cooking insert is made from stainless steel with a three-layer base for even cooking, and there is an optional nonstick cooking insert available from the manufacturer. The steam rack can be used for steaming or as a lifting rack for larger foods. The yogurt function starts by heating the milk to a high temperature for pasteurization, then continues at a lower temperature for fermentation. You can make a batch directly in the cooking insert or in individual glass jars. The Instant Pot offers plenty of timer functions to make cooking fit into your schedule. You can choose to delay the start for up to 24 hours. And the automatic keep-warm feature will hold cooked food for 10 hours, while the manual keep-warm feature can hold food for up to nearly 100 hours—more than enough for any potluck or party. The silicone sealing ring that comes with this model tends to pick up food odors, but replacements are available from the manufacturer or on Amazon. Some users prefer to keep one ring for savory foods and a second ring for more delicate sweet foods. This model is also available in 3-, 5-, and 8-quart models. From the name you've learned to slow cook with over the years comes this multi-cooker that cannot only pressure and slow cook but it also lets you brown, sauté or steam. All of these functions can be set with a delayed timer so you can ensure a freshly done meal when you get home. 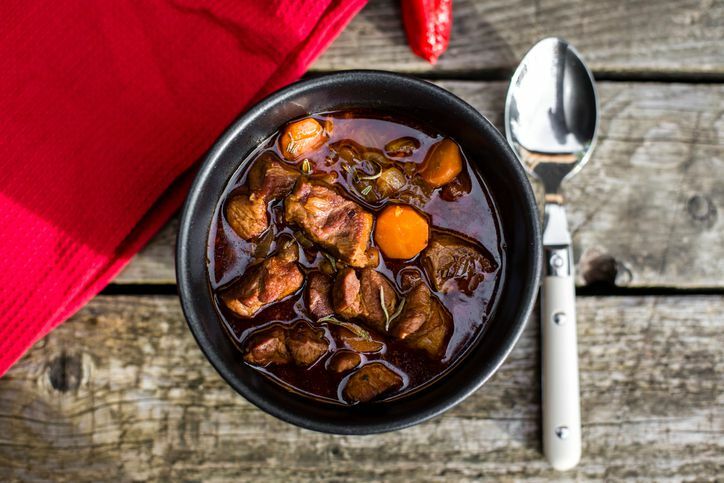 With easy setting such as meat/stew, beans/chili, rice/risotto, yogurt, poultry, dessert, soup and multigrain you can cook up a whole feast of meals. With this purchase, you'll also get a recipe book with plenty of ideas, a steaming rack and a serving spoon to help whip up dinner in a jiffy. Plus, the cooking pot is dishwasher safe so cleanup is a breeze. While most electric pressure cookers these days also have a slow-cook option, this one takes the concept further with menus that can automatically adjust the time, temperature and pressure between fast and slow cooking. For precise temperature control, this has sensors at both the top and bottom to monitor temperature and pressure. It also has a hands-free steam release for extra safety, and the mode used for steam release changed based on the food settings chosen. 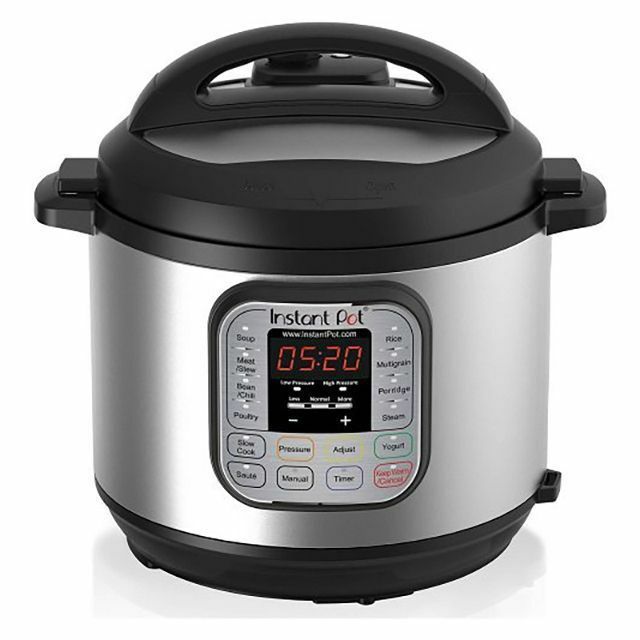 This has settings for 11 pressure cooking functions; slow cooking at high or low for up to 12 hours; steaming, sautéing, searing, reducing, and keeping the food warm. It also has a custom setting, so you can follow recipes perfectly. When the cooking is done, it switches to the keep-warm mode. The LCD changes color to indicate the current step in the process: pressurizing, cooking, or releasing steam. The bowl has a ceramic coating for easy washing. This includes a rack and a steaming basket for even more versatility. While this has a lot of settings for different foods and functions, many people will only need high or low pressure, so it might be overkill to have more options that you’ll use. While electric pressure cookers have become more popular, stovetop cookers are still very useful. This one is made for the serious cook, with a one-button locking system, a uniquely designed lid, and intuitive pressure controls that make it easy to understand and it use. The unique locking rim secures the lid to the pot in any position, so there’s no need to thread or align the lid with the pot for a proper seal. Once in place, it locks with the touch of a button and the pressure indicator pin pops up with pressure is reached, so you can easily monitor the cooking time. The pressure release valve lets you set high or low pressure, and safely releases pressure when cooking is done. Because stovetop cookers can operate at higher pressure than electric models, they cook even faster, and this one can reduce cooking times by 50 percent or more. This is made from stainless steel with stay-cool silicone-wrapped handles. It can be used on any cooktop, including induction, and is dishwasher safe. With the lid off, it can be used as a standard stockpot. If you like the idea of an electric pressure cooker, but you’re cooking for just a few people and don’t have extra space to spare, this 6-quart pressure cooker has all the features of larger units with a smaller footprint and a smaller cooking capacity. The Mealthy MultiPot features nine cooking options: pressure cook, slow cook, make rice, sauté, steam and more. The main cooking pot is made of sturdy stainless steel that's perfect for making anything from chili to yogurt to even cakes. The device also comes with a stainless steel steaming tray that you can use to steam vegetable at the same time as you prepare whatever is in the main chamber of the pressure cooker. This Amazon Choice product is perfect for smaller kitchens and comes with recipes and a helpful app, too. If you regularly cook for a crowd, this 14-quart electric pressure cooker has the capacity to cook large batches of food every day. For convenience, it has 12 cooking presets that set pressure and time for the best results, including rice, multigrain, porridge, steam, soup, meat/stew, bean/chili, sauté, poultry, yogurt, slow cook, and eggs. The LED displays show cooking time, temperature, and pressure. There is a delay timer so you can start the cooking time later. Both the cooking time and the pressure are adjustable, so you’ll always get the results you want. For easy cleaning, the cooking pot has a ceramic coating. This is a large cooker, so it will take more counter space that an average-sized cooker, and it’s also much heavier, weighing in at 18 pound before food is added. It includes a steam rack, steam basket, rice scooper, and measuring cup. If you don’t need all the extras, but you want to try pressure cooking, this budget cooker is just what you need. The pressure regulator maintains an even cooking pressure, and the cover lock keeps the lid closed and indicates that pressure remains in the pot. Unlike some of the cheaper pots, this one is made from stainless steel rather than aluminum, so it’s fine for cooking acidic foods, and it’s dishwasher-safe. It includes a rack for keeping food lifted off the bottom of the pot. This pot does not have adjustable pressure. It also comes in a 4-quart size. This pressure cooker comes with a dial gauge for precisely monitoring internal pressure, which is important when pressure canning, and even more important if you’re canning at high altitude. If you want to use your pressure cooker for canning, you'll need to look for one that's approved by the USDA for pressure canning to be on the safe side. This canner is made from aluminum for even heating, and can also be used as a boiling-water canner. It can also be used as a large-capacity pressure cooker, but since it’s made from aluminum, it shouldn’t be used for acidic foods like tomatoes. This includes a rack and holds up to 7 quart jars, or two layers of 9 pint jars. The pressure cooker lid should not be immersed in water for cleaning, and the dial gauge is somewhat delicate. Before using for canning, the gauge should be tested to make sure it’s accurate. Great for small families and singles, or for folks who want a second pressure cooker for side dishes and appetizers, this 4-quart pressure cooker is also the perfect fit for small kitchens. While the size is small, the features are large, with one-touch preprogrammed buttons that adjust the temperature and pressure for a variety of foods. The inner cooking pot has a nonstick surface, but it can be washed in the dishwasher, saving you cleanup time. The digital display makes ​is easy to check the cooking progress, and the keep-warm mode lets you hold food at a safe temperature while you wrangle the family to the table. A delay timer lets you set up the cooker in advance, so it finishes at your desired time, so your food will be ready and waiting for you at exactly the right time. Our reviewers spent 18 hours testing one top-rated pressure cooker. They set it up in their kitchens, whipped up their favorite foods, and evaluated its performance. We asked our testers to consider the most important features when using this pressure cooker — from its capacity to its special features — and we've outlined them here so that you, too, know what to look for when shopping. Stovetop vs. electric The first decision you’ll make is whether you want a stovetop model or an electric one. Both will reduce your cooking time, but stovetop models achieve higher pressures and will cook your food slightly faster. Electric models, on the other hand, tend to have more features and can turn themselves off automatically when cooking is done. Capacity Pressure cookers come in a variety of sizes. Keep in mind that you can’t fill the cooker to the top since it needs space for food expansion, to create pressure, and to make sure food doesn’t bubble up through the pressure valve. Overall, large pressure cookers are great for bigger batches of food, but they may not fare as well when cooking small batches. Features While electric pressure cookers have more buttons and features than stovetop models, there are differences to consider between them — like the style and placement of the pressure release valve, handle, and locking mechanism. Just think about what matters most to you! “Whether you simply want to make white rice in three minutes or prepare a small chicken, this product saves a lot of time — up to 70 percent! — and effort in the kitchen,” gushed one of our testers, who used it to cook vegetable lo mein and honey teriyaki chicken. Generally, our testers were pleased with this cooker’s versatility and the fact it was “surprisingly easy” to clean. As for its size, one reviewer said it was “great if you’re looking to make large portions, but it’s rather big to leave on the counter or store in a typical cabinet.” Our testers also thought it might be a little intimidating for first-time users but offered a suggestion: Watch a few YouTube tutorials before you dive in and you’ll be good to go.